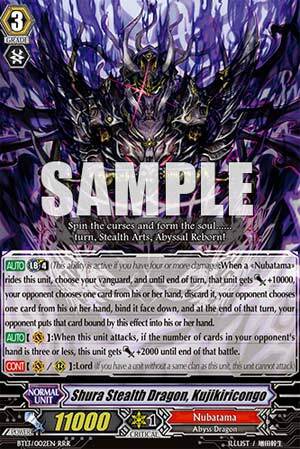 [AUTO] Limit Break 4 (This ability is active if you have four or more damage):When a «Nubatama» rides this unit, choose your vanguard, and until end of turn, that unit gets [Power]+10000, your opponent chooses one card from his or her hand, discard it, your opponent chooses one card from his or her hand, bind it face down, and at the end of that turn, your opponent puts that card bound by this effect into his or her hand. [AUTO](VC):When this unit attacks, if the number of cards in your opponent's hand is three or less, this unit gets [Power]+2000 until end of that battle. ...combining the two main aspects of the Nubatama clan, Kujikiricongo is definitely a scary sight to behold. He has a solid 11,000 power with a Break Ride that combines old school Nubatamas of discarding with the new school Nubatamas of binding. When you Break Ride, the new Vanguard gains 10,000 Power, and you get to make your opponent discard a card from their hand AND bind one of their cards for a turn. The fact that this card disables a good chunk of your opponent's guarding capabilities makes this a very underestimated card and definitely a candidate as a overlooked gem. The point gain boost that all Break Rides have is pretty okay by itself, but definitely can be pulled off easier by going Break Ride over Break Ride as that will more than likely make your opponent'd hand to less than 3 by then especially if combined with the pressure capabilities of Dreadmaster and Kuroko. Overall, the fact that this is as overlooked as it's been, maybe now is a good time for the Nubatama Ninjas to finally rear out their heads! What in the...Nubatama support! Holy crap every hipster's dream came true. But anyway, what we have is one of Nubatama's only two viable aces, Kujikiricongo (mouthful). It's a Break Ride that grants 10k to your VG as usual, and then it discards one of the opponent's cards in the hand, and binds a card in their hand face down until the end of the turn. This is a finisher, designed to help end the game in one shot. The bound card could also technically turn into a plus if its attack hits and our new starter Kuroko is boosting, but it'll be Late Game by then, so don't count on the Vanguard ever hitting by this point. Instead, it's best used to knock out valuable hand out of the opponent to screw their guard. Which would be fantastic if Nubatama had more than one of each trigger. With what they've got, you seriously need to hope for the best trigger-wise since you don't have the luxury of any higher than 4 Criticals to screw them in terms of damage. Which is a problem, since the more damage the opponent has and the less guard they have, the better this would be. Basically, make sure you can end the opponent on the spot on the turn you do Break Ride, since after you've exploded that turn, you're fairly high and dry. He's useful though, so that's a plus in his favour.